Xtend IVR Configurator (XIVRCFG) allows the user to change various configuration options for the Xtend IVR. You can use this program to change options like currently executing script, TAPI device to be used, enable/disable Text-to-speech engine, select voice, logo, About Box settings etc. 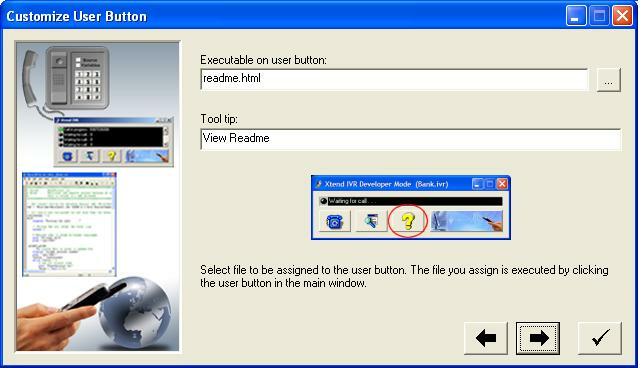 User can navigate through the window using the Next and Previous buttons. In order to quit without saving the settings, just press the ESC key. - Next button. Moves to the next option. - Previous button. Moves to the previous option. - Save button. Save all modifications and quit. Xtend IVR requires that you install at least one TAPI Device / Voice Modem / Xtend Voice in your system. But if you are using only the Developer Edition you can ignore this option. If more than one TAPI devices are installed (which is true if you are using a multi-line support Xtend IVR), you must select at least one TAPI Device for the Xtend IVR. Otherwise, Xtend IVR will give you an error message on the startup. If more than one TAPI devices are installed in your computer, but you got only a single line version of Xtend IVR, then Xtend IVR will select the first TAPI device by default. Others will be ignored. 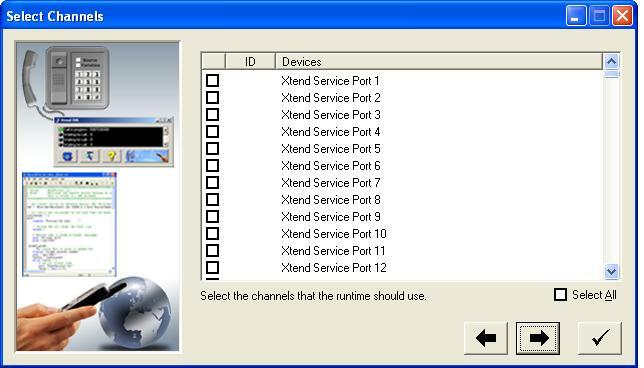 Here, the user can indicate the channels that the Xtend IVR Runtime should use. 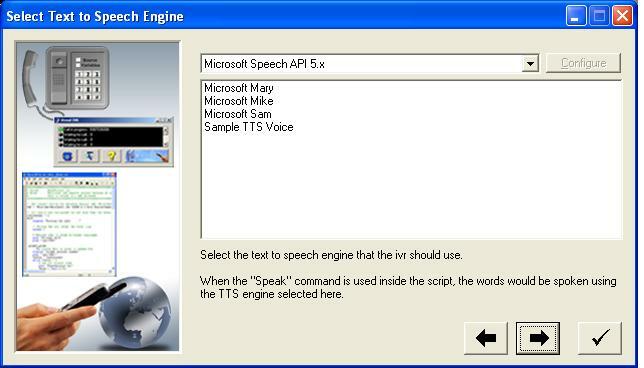 Text-to-Speech(TTS) engine articulates the written text given with the Speak command inside the script. The above picture represents the selection of the TTS Engine and the default voice to be used by the TTS engine. The TTS engines installed and the voices defined in the Speech Synthesis engine will be appropriately listed in the boxes. If not installed, then the list will be empty. 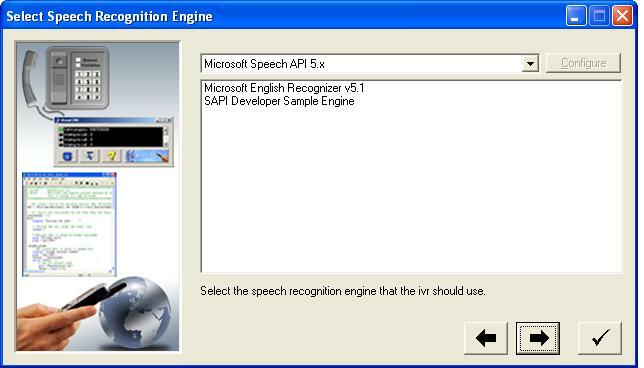 The Speech recognition engines, especially SAPI 5.x engines, installed in the PC would be listed by the system. From the recognised list, the user indicates his/her choice of the speech recognition engines for the Xtend IVR. 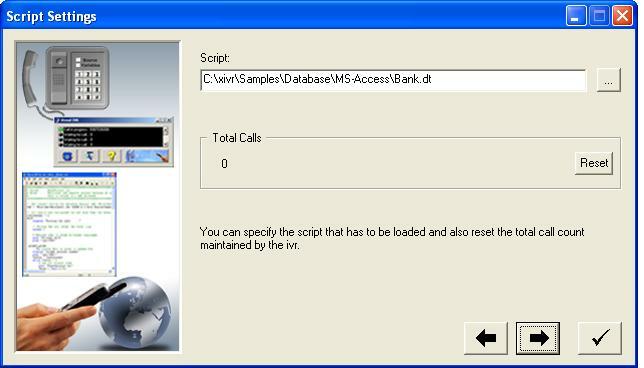 The user has the privilege to decide the default IVR script to be loaded, during the virgin execution of the Xtend IVR. The window also renders the IVR call counter information, which describes the total number of calls attended by the Xtend IVR. If required, you may reset the counter to zero. You can also give the Tool Tip to be displayed when the mouse is over the button. 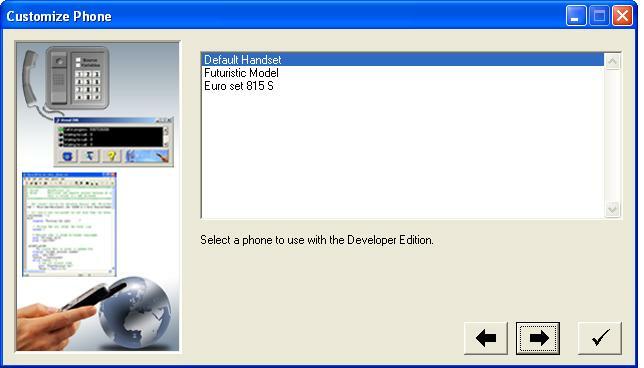 The look 'n feel of the simulated phone displayed along with the Developer Edition Main Window is determined by selecting from a variety of available skins. By default, the window uses a Grey-hued Telephone skin. By selecting the appropriate one from the window, which is visible only in a Developer mode Xtend IVR, you can change the total outlook of the showcased telephone to suit your taste. You can always customize the Xtend IVR Main Window to suit your needs. 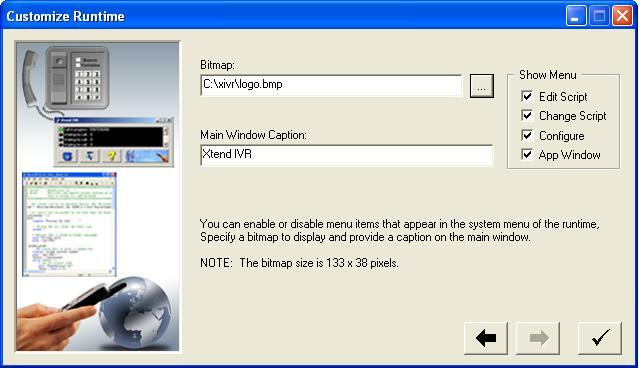 Xtend IVR allows you to change the Main Window caption, the About box bitmap on the right and the system menu items. The system menu items to be displayed in the Standard Edition are determined here by checking the corresponding boxes in the Show Menu. You can exclude the items by simply unchecking the appropriate options.